AYF Annual Barahantes Featuring Harout Pamboukjian! 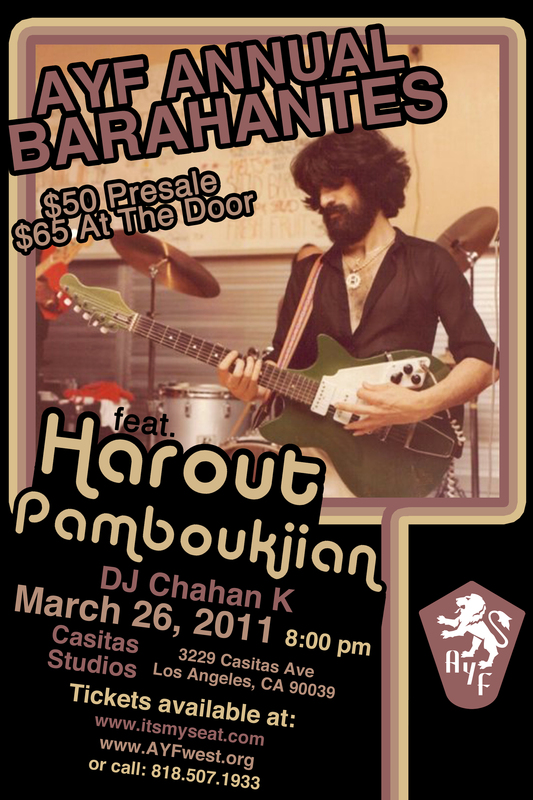 The Armenian Youth Federation proudly presents Harout Pamboukjian live with special guest DJ Chahan K at a very unique location in Los Angeles, Casitas Studios! This is an Event you definitely don’t want to miss! A Combination of a Warehouse Party and a Barahantes! 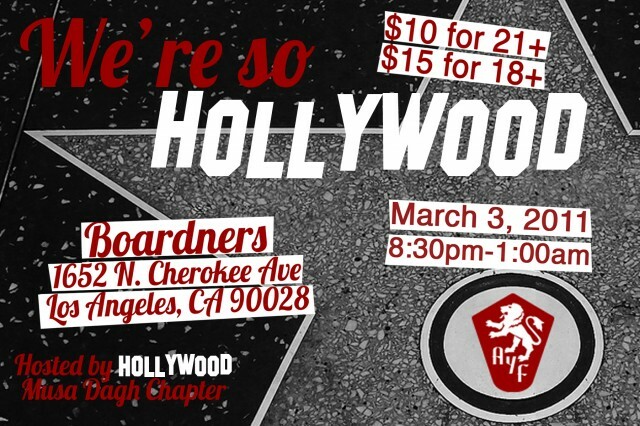 Join the AYF Hollywood Musa Dagh & party it up Hollywood style on Thursday, March 3rd at Boardners! Come out and Play Hollywood Style!! Celebrating a birthday? Contact us about a $100 Champagne special!! LOS ANGELESLegendary poet, Ruben Hakhverdyan, returned to Los Angeles after seven years on Sunday to perform in one of the oldest theaters in Downtown for an audience of nearly 2,000. The United States largest Armenian community crowded into the Orpheum Theatres majestic halls on Valentines Eve to pay homage to the bard of Armenias Independence movement, whose passionate prose inspired a generation to question injustice and demand freedom. The event was organized by the Armenian Youth Federation, which rallied its resources to help make the one-time performance a truly unforgettable one. In addition to being a performer, Ruben Hakhverdyan is a storyteller, making him all the more unique. On Sunday, he captivated his audience not only with his beautiful music but also with the memories and stories that lie beneath his lyrics. Performing both old and new songs, Hakhverdyans verses dealt with everything from fatherhood to societal ills, all the while awakening a yearning for Armenia for all those in attendance. Just as he explained to his fans when he began his show with This is Yerevan, Hakhverdyan described any place inhabited by Armenians as Yerevan, giving the feel that one could walk out of the Orpheum theatre onto the streets of Armenia at any second. I have given concerts for Czech, Serbian, and French audiences, and those performances are not very different from one another. The reception everywhere has been very warm, Hakhverdyan said after the concert. 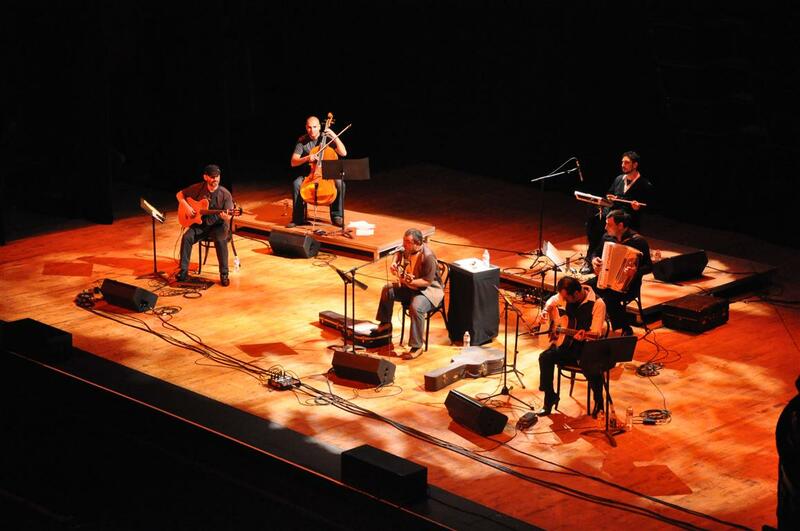 Given his much anticipated return to Los Angeles, the diverse audience that filled the nearly sold out theatre was composed of both old fans and new fans of Hakhverdyan, eager to experience his timeless music first-hand. Accompanied by his four-member band, the performance took the crowd through an emotional musical journey that reverberated in the hearts and minds of everyone who packed the halls. On the heels of his 60th birthday, Hakhverdyans concert was not only a celebration of his contributions to Armenian music, but of the modern day Armenian experience itself. The legendary singer, composer, and poet promised another concert to his fans in September of this year, which will feature his repertoire of new songs. 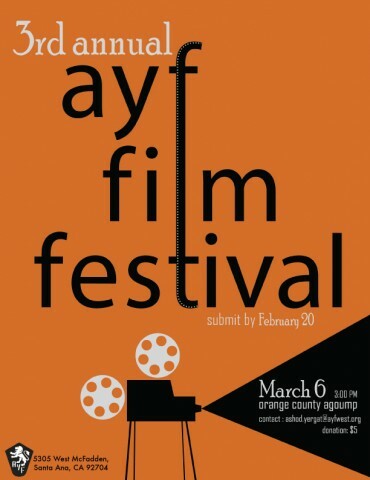 Its time for the 3rd Annual Orange County Film Festival showcasing the cinematic feats of young Armenian filmmakers, screenwriters, and auteurs. So it’s February, which means Valentine’s Day is coming up. I’ve never actually celebrated Valentine’s Day because I can’t stand the idea. For me Valentine’s Day is just a day for retailers to make a profit. Do we really need a single day to show love? No, we don’t. This is why the Youth Corps Central Council works year round to show our love for our homeland. So on February 10th, we ask that you join us in celebrating the love you have for Hayasdan! While the DJ is spinning, we will be sharing personal stories, reliving memories and toasting to new ones. If you’re looking for ways to celebrate Valentine’s Day that doesn’t involve cheesy cards and heart shaped boxes come join Youth Corps supporters for the “I Left My Heart in Hayasdan” Party at Rockwell. The event is priced from $10-15. All proceeds will go directly to the AYF Youth Corps Program. What’s not to love? GLENDALE, CAMembers of the Armenian Youth Federation on Saturday packaged thousands of pounds of clothing, bedding and household supplies into more than 100 boxes to be shipped to villages throughout Armenia, Artsakh, and Javakhk. The items were collected over a two-month period last year, from 9 drop-off locations throughout California, and in Las Vegas. 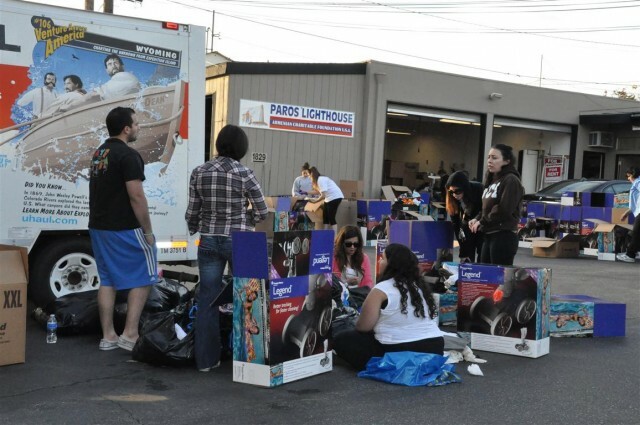 The boxes, each weighing 50 pounds, were transported Saturday to the Long-Beach warehouse of the Paros Lighthouse Armenian Charitable Foundation. Paros will then send the boxes to warehouses in Armenia, where they will be sorted and distributed based on individual family needs, village by village. The Paros Lighthouse Charitable Foundation, established by Zuhrab and Seta Ghazarian in 2000, is a 501(c)(3) non-profit that gives donors and sponsors in the US and around the world an opportunity and vehicle to assist in the support of the needy and fallen families in Armenia. The Armenian Youth Federation is the largest and most influential Armenian American youth organization in the United States, working to advance the social, political, educational and cultural awareness of Armenian-American youth. Gyumri, Get Ready. We’re Coming…. Just another Youth Corps committee meeting. For several years, the AYF Youth Corps program has roamed my mind, finally I’m of age and the idea is reality. My summer plans are set, one way ticket to Armenia please! Hearing the stories of Youth Corps Alumni and watching their faces turn a different shade of happy is inspiring. Although I’ve toured Armenia various times, I expect this time to be completely different. The past few months, I have become very impatient. Sitting in class, I spend more time thinking of the kids in Gyumri, then my papers. To cure this insanity, I have jump-started my summer by working on the Youth Corps central council. Through weekly meetings, the committee has formulated a plan to make this program as great as always. The application is up (here), the brochures are printed (download it here), and presentations are being set up. AYF chapters and the committee are working together to plan fundraisers, and hope to raise an ample amount of money, so the participants will not put too much out of pocket. The hard work of the committee will be worth it in the end, because this will be the best year yet! To keep up with everything going on or for more information, visit the website the Youth Corps fan page on facebook at facebook.com/youthcorps. The new Youth Corps brochures. FRESNO, CAThe Armenian Youth Federations Fresno Kevork Chavoush chapter collected and delivered more than 700 toys to orphanages throughout Armenia and Karabakh this Armenian Christmas, reported the Armenian Youth Federation. The toy-drive, an annual tradition for the chapter, began mid November 2010 and ended on January 6, 2011 with the delivery of the toys to orphanages operated by the Armenian Relief Society. 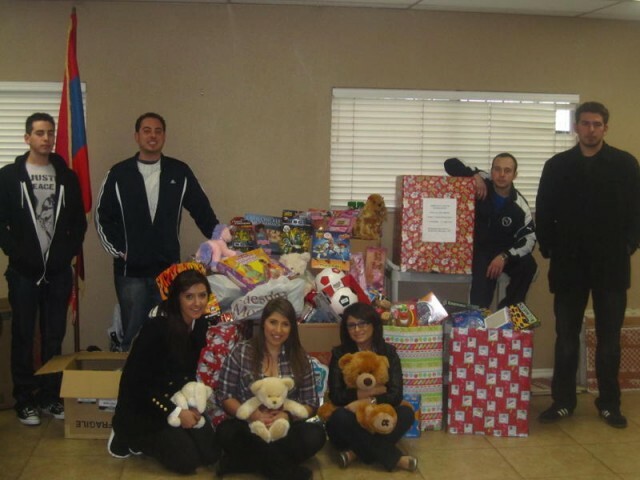 According to Chapter Chairperson Anto Torossian, this was the most successful toy drive to date. Four years after starting this tradition, the chapter was able to put a smile on the face of 700 different children, the most weve ever impacted, explained Torossian. We could not have done this without the help of our local community, the dedication of our members and the support of the Armenian Relief Society.